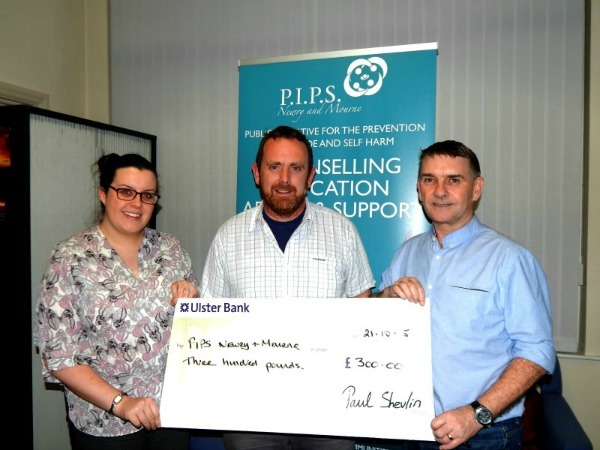 Local Augher man Paul Shevlin is seen presenting representatives of PIPS Newry and Mourne, Suicide Prevention Charity, Seamus McCabe and Louise O Reilly with a donation of £300, Paul completed a cycle from Augher to Croagh Patrick a distance of 139 mile and climbed Croagh patrick on the same day. Paul would like to thank his family and friends and eveyone who donated or supported him. PIPS Newry & Mourne would like to congratulate Paul on his successful cycle and climb and also thank Paul and his very kind donation.